This book doesn't blow me away like The Wrath and The Dawn, but it still has some elements that I really enjoyed. 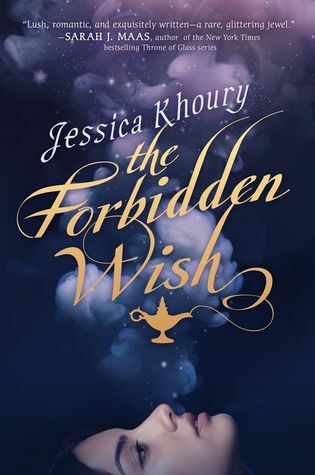 For starters, TWATD is an Arabian Nights retelling, while The Forbidden Wish is a retelling of the well-known tale of Aladdin. If you don't know Aladdin, it's the Disney movie with The Whole New World song and the blue Genie. The author twists the story into something familiar, yet entirely her own. And while TWATD pays more attention to the cultural backdrop, The Forbidden Wish pays more attention to the mythology. The jinn realm, power, old kingdoms. It's like listening to your own folktale. "I know so little about you and it eats at me night and day. Who are you? Why do you infect my mind?" This book is heavily about romance. I think we all know from the synopsis is about forbidden love between a human and a jinn. It's like the main goal of this book. But the best thing is, it's not insta love! It took them a while to fall for each other, with lots of denial, incoming war and political intrigue. It makes me enjoyed and ship them even more! The writing style is gorgeous. The author describes everything in lavish details; the palace, the city, the world, the gylphs, the myth, you mentioned it. It's just so beautiful and poetic, but it's not purple prose. I love the friendship between Zahra and Roshana, how it eventually became both of their downfall. It's just so magical and intricate and amazing to see how Zahra still yearns for her after thousand of years! It's just so tragic and heartfelt how eventually they're both destroyed. The characters. GUYS. This book is full of strong, independent women. None of them are fighting for the male attention. Zahra is fierce and determined to get her freedom and to not repeat her mistakes. Caspida embodies Princess Jasmine; she won't bow to the tradition and fights the evil vizier. And she and her handmaidens formed a group of female assasins! How cool is that??? Overall, I really really enjoyed it! The writing style is just so amazing, and it fulls of female character. But the plot could be a bit dragged, especially the whole "I-love-you, but-we-can't-be-together-it's forbidden". And I feel like it's lacking something to make this even more enjoyable. It's still a really good book though if you love The Wrath and The Dawn. The whole romance thing also put me off, but after diving into, it's actually more than that! I hope you'll enjoy it! This is the second review of this book that I've read recently, and I have to say I am getting more and more interested in reading it! I love the sound of the lush world building, and the fact that even though there is a heavy romantic plot it isn't insta-love. Also, I am a huge sucker for retellings - I love getting a new version of a story I've known all my life. It's fantastic! The female characters in this book sound AWESOME, and I am always up for assassins. Female friendships are also super fabulous. Amazing world building are the best! I love "travelling" to those places and just explores it more as the story progresses. I know, it's really hard to find books about female that supports each other instead of doing catfights, so I'm really pleased when this book writes such a strong female bond! I'm so sad that you didn't love it more! I didn't feel as if it focused much on romance (though it did at the same time) and the author just honestly kind of pulled me into the richly told story as the romance blossomed! I really loved this book, and YES. STRONG WOMEN GALORE. I think I didn't enjoy it that much because I constantly compared this book with The Wrath and The Dawn??? I know it's a totally different books based on totally different fairytales, but I just can't help it! TWATD is the main reason I read this book. So yeah, I definitely think my opinion is kinda biased!